The lightweight feel, similar smell, and ingredients in this equate dupe make it a great money saver. Both lotions kept pimples at bay while still moisturizing our dry winter skin. Brandefy compares store brands (e.g., Equate) to name brands (e.g., Clean & Clear) to reveal when the store brand is as good as the name brand, and to warn you when it is not. Our goal is to help you save time and money, and to have a good time while doing it. Sorry, Clean & Clear, Equate's acne moisturizer worked just as well for us! Occasionally we get stressed and stress makes us break out... here come the pimples. We have to alter our routine to keep the zits at bay, but in the winter we still need to moisturize. 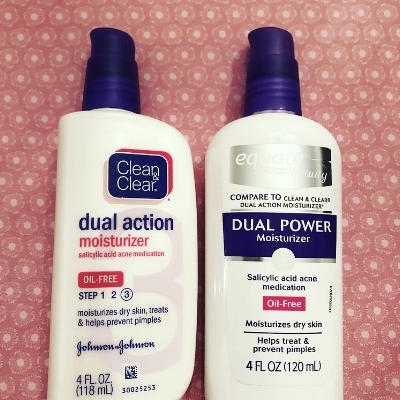 We were excited to see that equate makes a dupe of the Clean & Clear dual action moisturizer. This product promises to moisturize and treat pimples. Upon assessing the active ingredient, we found this to be very similar. The inactive ingredients are also similar, but not the same. The packaging looks a lot alike, but the Equate pump did take a little longer to get the initial product out. Once we rubbed both lotions into different sides of our faces, we agreed they both smelled mild and felt lightweight. We certainly don't like to feel like we're gobbing anything heavy onto our skin. Thanks for making a great dupe, Equate! We will be grabbing this next time we feel a breakout coming on!